Have you ever wanted to launch your own online course? You've got something that you want to share with the world but did not know how to get started? In this live webinar the founder and CEO of LifterLMS will show you how you can use WordPress (the #1 system on the planet for creating websites) and LifterLMS to do just that. LifterLMS is a Learning Management System which is built on top of WordPress as a plugin. Is super simple to use and has loads of powerful features which will mean that you're going to be able to customise every-single-thing that your students will experience. It contains all of the components to create, sell and protect you course materials. Whatever stage you're at with your online course aspirations, LifterLMS will be a great fit. Join this live webinar to find out more and ask Chris your questions. 7pm (UK time) on 28th February 2019. I run the WP Builds podcast with my good friend David Waumsley. We drone on about WordPress to anything that has a pulse. Chris started learning about online education on a glacier in Alaska. He's created courses on everything from organic gardening to wood working. He is passionate about helping other entrepreneurial educators find success and create impact. Have you ever wanted to launch your own online course? You've got something that you want to share with the world but did not know how to get started? 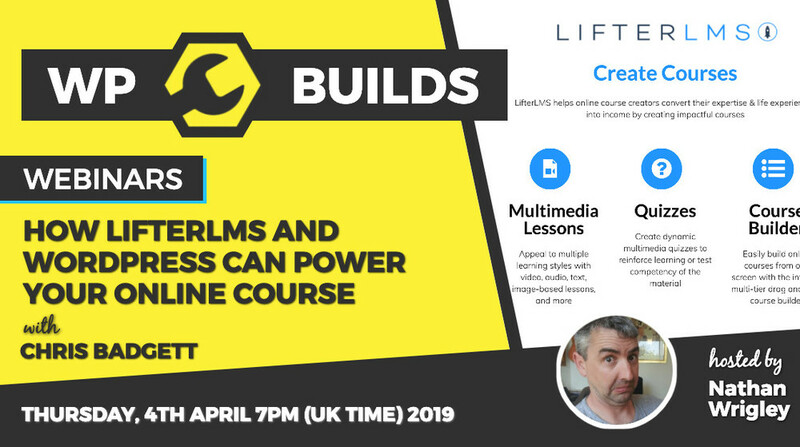 In this live webinar the founder and CEO of LifterLMS will show you how you can use WordPress (the #1 system on the planet for creating websites) and LifterLMS to do just that. LifterLMS is a Learning Management System which is built on top of WordPress as a plugin. Is super simple to use and has loads of powerful features which will mean that you're going to be able to customise every-single-thing that your students will experience. It contains all of the components to create, sell and protect you course materials. Whatever stage you're at with your online course aspirations, LifterLMS will be a great fit. Join this live webinar to find out more and ask Chris your questions. 7pm (UK time) on 28th February 2019. WP Builds webinars and online meetings discussing all things WordPress with Nathan Wrigley.